The winter months are a good time to force flower bulbs indoors to give you a dose of spring any time of the year. Narcissus (also called paperwhites) is one of the easiest bulbs to force. Almost any container will work, from a ceramic bowl to a tall glass cylinder, as long as it does not have drainage holes. Layer two to three inches of pebbles, glass beads or marbles in the bottom of the container (make sure you rinse these first). Depending on the size of the container, place three bulbs root-side down and almost touching each other on top of the pebbles. Use more bulbs for a large container. Add room temperature water to fill the container to just below the bottom of the bulbs. Replenish the water as needed to the bottom of the bulb. In about four weeks, you will have blossoms, and fragrance, filling your home. Narcissus can grow too tall and flop over. A trick to keeping them shorter and standing upright is to use a diluted solution of alcohol. Once a green shoot is growing one to two inches tall above the bulb, pour off the water and add a solution with 4 to 6% alcohol. You can make your own with any hard liquor—vodka, whiskey, rum, tequila, but not beer or wine. Mix a container with approximately 1 part of a 40% spirit to 7 parts water. Use this mixture to water the bulbs. Rubbing alcohol (isopropyl alcohol) can be used, but since this is usually 70%, mix it in a one part to 10 parts water combination. The result will be a stem one-third shorter and stronger. It’s ok to discard the bulbs after they flower as they might not bloom again. Clean the pebbles and container, and store these away until next year. Other spring bulbs like hyacinths and crocus require a chilling period in order to bloom indoors. This simulates their natural response found in nature—sleeping when it’s cold. Tulips and daffodils are a little harder to force. 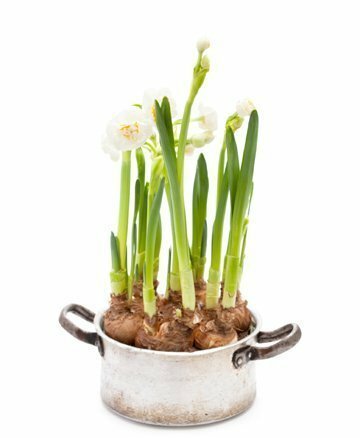 Forcing bulbs that need a chilling period is a more complex process of planting these in a container with soil (or a special forcing vase for hyacinths), storing them at 35 to 45 degrees for 8 to 18 weeks depending on the bulb, followed by bringing them out of the cold and waiting three to four weeks for the bloom. If you do plant these chill-required bulbs, you can replant them outdoors after the foliage yellows in a month or two. A word of caution; it may take years for these bulbs to build up enough energy to bloom again. If you do plant these chill-required bulbs, you can try replanting them outdoors after the foliage yellows in a month or two. A word of caution; it may take years for these bulbs to build up enough energy to bloom again.